The Boston Nacho News Network (BNNN) is all atwitter today with the news that Jalepenos is closing (the curse of Our House West rears its ugly head…). But with its passing comes another crappy Mexican restaurant–this time in the doldrums of Quincy Market. On first glance, Mija Cantina & Tequila Bar seemed to be a lovely oasis with a design concept best described by our friend Zach as “pro-tourist salvage-yard neo-mexigoth.” We would have been wise, however, to heed the advice of the many Yelp reviewers who cautioned us to keep clear. Upon arriving, a nervous looking hostess told us it would be an hour wait for a table of seven. This was Wednesday early evening, and once we pointed to a whole slew of empty tables and told her we would just sit separately, she told us they could push two tables together. While waiting for our table, we noticed numerous waitresses demonstrate an absolute inability to hold a tray. Our waitress could only find one drink menu, and then brought out the wrong beer three times. We asked for a Long Trail IPA–first they served us Bud Light. Twice they brought out Harpoon IPA. We gave up after that. It took five bartenders 22 minutes to serve us two margaritas so bad that we had to send them back. Based on the description on the menu, these nachos had promise: tortilla chips, charro beans (pinto beans with bacon and chorizo) , Monterey jack cheese, chile con queso, pico, crema, guacamole, and carnitas. Quality: (7) We enjoyed the carnitas and beans; however, the chips were both unevenly cooked and unevenly salted, so much so that there were bites that left us choking and teary-eyed with sodium overdose (and Nacho Patrol LOVES their salt). The guacamole and salsa were nothing special. Distribution: (7.3) There were a lot of toppings, but overall the dish was heavy, rather than complementary. The unevenly cooked chips only added to the problem as some became incredibly soggy under the weight of all the toppings. Price: (3) The management might think that $13 nachos (and $11 margaritas) are appropriate for the space and location, but we say they simply aren’t worth the trouble of dealing with this establishment. Overall: 24.8/40. These nachos aren’t bad, but please, don’t go. This place hasn’t yet earned the right to be in business and we don’t want to encourage them! We were lucky to share this meal with a small army of food industry professionals, and as they pointed out, a new restaurant needs a competent wait-staff to support it while it builds a reputation. Sadly, Mija’s under-qualified staff and overpriced menu handicapped what could have been a pleasant dining experience. We will be eagerly anticipating the next Mexican restaurant to sweep in on the Tex-Mex tides. Looking for overpriced Mexican food? Weak margaritas? Bro-ish atmosphere? A stuffed buffalo that occasionally breathes smoke??? Are you in the Hynes Convention Center area or willing to commute to get there? If so, than Nacho Patrol has the place for you! Appearance: (9) For all the crap they do wrong, Cactus Club certainly has presentation down to a science. Despite a little char, these nachos were absolutely beautiful, as fresh and bright as a sunny day. Quality of Ingredients: ( 7 ) how refreshing to get some black beans! It went a long way it battening down the chili powder hatches, which seemed to have blown open in some sort of Incident. It was literally a chili powder keg, reminiscent of some childhood mess your mother made in the crock pot. However, we did enjoy the pico (a little chili-ey itself) and the lemony guac. Distribution of Toppings: (7) We suspect Cactus Club may have, at some point, hijacked Cabot Farms to fund the massive volume of cheese used on these nachos. The farmers weep and the cows’ udders are utterly tapped. At that same point, somewhere on the coast, three Nacho Patrollers simultaneously witness the glory of oh-so-much gooey cheese while attempting to chisel the clots out of their hearts. Luckily the excitement brought us back to life–it only took as a little digging to discover that the cheese was simply a ruse to disguise the plate of naked chips below. Sure, there was a lot, but in not layering it, the “cheese helmet” cooled and congealed quickly, making for an unpleasant and difficult nacho experience. Also, this could be nit-picky, but the wax paper underneath the nachos often proved to be problematic. 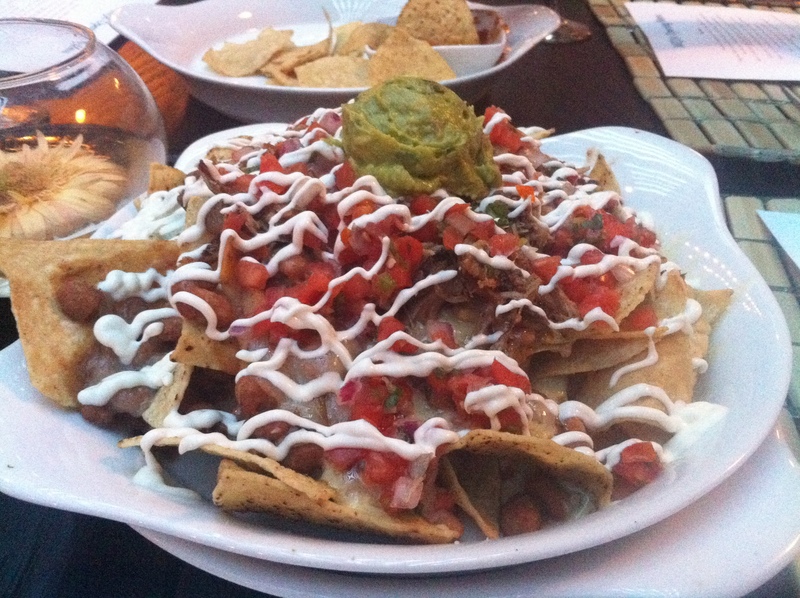 Price: (5) $12 for this particular plate, which we officially award the “Biggest Rip-Off Award” in Nachos. They do offer an $8 option, sans meat and guac. $8 for chips and cheese. A travesty! 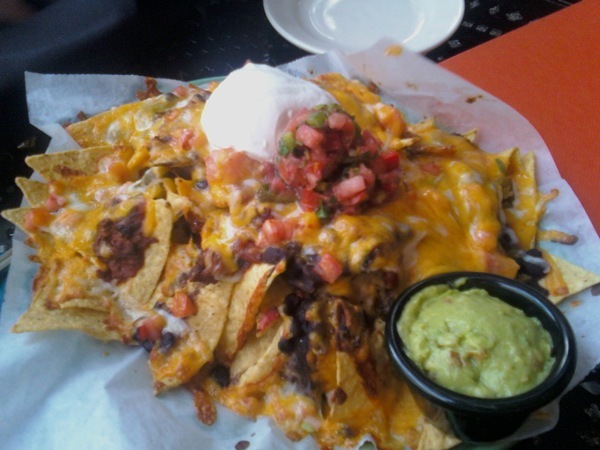 Boylston, Boylston, Boylston…What shall these Nacho-Lovers do with you? After our overrated margaritas and wallet-cleaning nachos, we considered being sad. But then we remembered that Pour House is right next door…and there was much rejoicing.